The last time that Lucie Safarova and Dominika Cibulkova met on the tennis court I was watching the match live. On that occasion, Cibulkova defeated Safarova in her first match since the French Open final, 7-6(7) 6-4 in a second round match in Eastbourne. It was a very close match with just a few points separating the pair. For the third time this week, Safarova will go up against a player she lost to the last time they played. In the first round, Safarova turned the tables on Daria Gavrilova who she had lost to in Toronto. On this occasion, Safarova produced an aggressive, yet patient display to beat Gavrilova, 6-3 6-4. (see recap HERE). In the second round, Safarova earnt a first win over Irina-Camelia Begu, displaying a superb serving performance where she dropped just eight points on serve. I was sceptical as to Lucie taking a late wildcard into New Haven but I think that it has paid off. This is the best tennis that she has played since the French Open and it sets her up perfectly for the US Open. To be honest, i’m not too bothered about her going deeper in the draw because I think she’s already got out of this week what she needed. 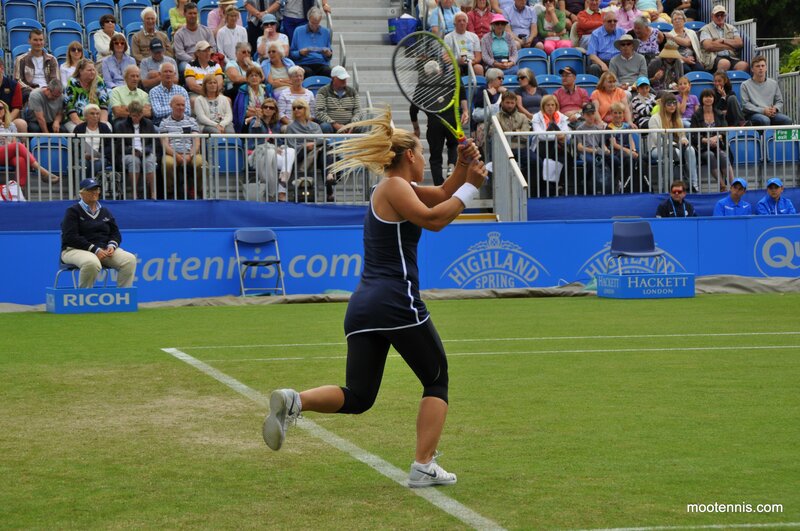 Cibulkova’s had her best week since Eastbourne where she made her comeback from achilles surgery. In New Haven, Cibulkova has scored two tough three set wins over Tsvetana Pironkova and Kristina Mladenovic. Domi’s determination and fighting spirit shone through in her match against Mladenovic (see match recap HERE). Cibulkova leads the head-to-head against Safarova, 4-1 with all five matches being decided in straight sets. Safarova’s lone win came at Wimbledon last year in a super match. If Safarova continues to serve well then I think she will take this one. Furthermore, Lucie has been excellent at overturning losses so that should give her confidence with the head-to-head. However, I wonder if Lucie will be fully engaged and want to win the tournament with attention switching to the US Open. For Cibulkova, I think there is more on the line as every win in New Haven is vital ranking points to help her move up from her current ranking of 58. I think Domi will be more motivated for the win. To keep up to date with the latest posts and happenings in WTA tennis, check out the official Moo’s Tennis Blog Twitter and Facebook pages. August 26, 2015 in Cibulkova, New Haven, Safarova, WTA. ← The Krane Training Method™ – Get Lower Back Pain Relief Now! It’s not a great matchup for Lucie because Cibulkova is very good at hitting right through the middle of the court and giving you nothing to put an angle on. But I think turning their h2h round might spur Lucie on to do something great here.